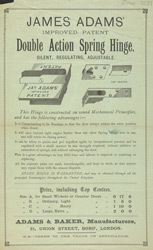 This is an advertisement for James Adam’s spring hinge. The 19th century was a time of innovation and invention and hundreds of patents were granted to scientists developing machinery and equipment for use in industry. The mechanisation of factories meant that objects could be manufactured easily and quickly and in very large quantities. Mass production appeared for the first time and instead of each item being hand made and thus subject to tiny variations machines produced identical objects, like for example the hinge featured on this leaflet.